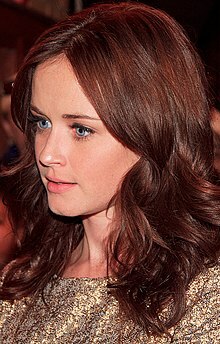 Kimberly Alexis Bledel (born September 16, 1981) is an American actress and former fashion model. She is best known for her role in the television series Gilmore Girls and for the films Tuck Everlasting, Sin City, and The Sisterhood of the Traveling Pants. Lynn B (October 7, 2002). "We're Hangin' With.....Alexis Bledel". A Girl's World. Retrieved on 2007-02-26. I think it caught on because the stories that these four girls have individually in the book are extremely relatable. They’re very real teenage experiences. I think the friendship between the four girls is something that is more realistic than a lot of the relationships we see between girls in movies lately. A lot of the time it’s like backstabbing or petty or superficial. I think most girls’ relationships are real friendships like these. I don’t think they’re that much more dramatic. Rebecca Murray. "Alexis Bledel and America Ferrera Discuss 'Sisterhood of the Traveling Pants'". Retrieved on 2007-02-26. This page was last edited on 23 July 2018, at 14:55.